Computer Coding and Web Applications seniors represent MVCTC at the OSBA Student Achievement Fair in Columbus on November 12, 2018. Pictured left to right - Chris Lawson (Huber Heights), Tyler Branham (Arcanum), and David Peltz (MVCTC Supervisor). 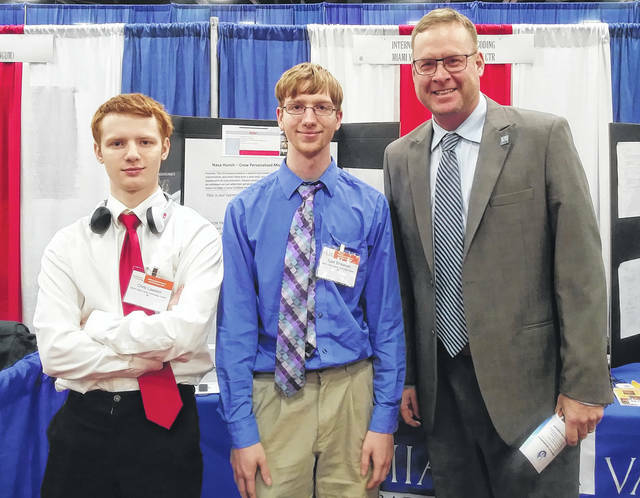 ENGLEWOOD — Miami Valley Career Technology Center (MVCTC) Computer Coding and Web Applications program was selected to participate in the Ohio School Board Association (OSBA) Student Achievement Fair. The Student Achievement Fair is held annually in November in conjunction with the OSBA Capital Conference in Columbus. Melissa Goodall, Computer Coding and Web Applications instructor, represented MVCTC with the presentation, ‘Internet of Things – Computer Coding.’ Mrs. Goodall and her two students Chris Lawson (Huber Heights) and Tyler Branham (Arcanum), shared the program curriculum with school board members and administrators from all over the state of Ohio. The Computer Coding & Web Applications program gives students a strong start to their software development careers. Students have the opportunity to achieve a Fast Track Programming certificate from Sinclair Community College. As part of the Sinclair Community College Fast Track Programming certificate, a melding of CC+ and other college credit opportunities combine to offer 18 college credits towards a Computer Science Associate’s Degree. Students learn system analysis and design, software application development, database design and management, and apply logical, algorithmic solutions to problem scenarios. The curriculum includes cybersecurity and industry best practices in development and application, ethical hacking, reverse engineering, and more. Over the two years, students gain application development experience using C++, Java, PHP, SQL, and web technologies. Students participate in Oracle’s globally recognized Oracle Academy program learning advanced SQL techniques. MVCTC is located in Englewood and serves 27 area high schools in five southwestern Ohio counties (Montgomery, Warren, Preble, Darke, and Miami). The career technical programs at MVCTC are designed to teach students skills relevant to their career goals while maintaining challenging academic classes and building relationships with classmates, instructors, and business leaders to help them be successful. The opportunities available at MVCTC prepare students for the workforce and college and allow them to graduate with thousands of dollars toward their college education. Computer Coding and Web Applications seniors represent MVCTC at the OSBA Student Achievement Fair in Columbus on November 12, 2018. Pictured left to right – Chris Lawson (Huber Heights), Tyler Branham (Arcanum), and David Peltz (MVCTC Supervisor).